There are 2 posts tagged installation (this is page 1 of 1). Automated installation is the way to deploy your ESXi configuration to your servers. After all it’s all about automating your IT operations and making your life easier. Nobody likes to do a simple task twice, so I would definitely recommend to automate your ESXi installation. ESXi uses kickstart for automating your installation. You can view more details on this in my previous post over here. All kickstart scripts start with the installation of ESXi. Afterwards you can add first-boot script to configure your ESXi installation to your specific needs. So if your using local disk select local and if your booting from SAN use remote. Some local disks, specifically SAS disks, are not presented to ESXi installer as local disks, but as remote disks. This is also acknowledged by VMware in this KB article. The solution is rather simple, but you do need to know the specific driver for the controller of your local SAS disk. In my case the server was a HP BL460c G6 blade. Thanks to this (Dutch) VMUG post I was able to trace the driver (hpsa) for the SAS controller in the HP BL460c G6. In this case ESXi first tries to install to the disk access with device driver hpsa. If that fail it will try to install onto the first local disk. If both options fail, the installation of ESXi will fail and you will error will be shown onscreen. Hope this gives you some better understanding in how ESXi installs itself onto disk. For more information have a look at the Setup Guide of ESXi here. So you have to deploy ESXi and think about automating the installation. Then the kickstart file is going to be your new best friend. It’s a think once, apply many concept to deploy ESXi to your hardware. At the moment I’m building an vSphere 4.1 infrastructure with 300+ HP blades. All need to be migrated from ESX 3.5 to ESXi 4.1. This requires a new installation of ESXi. I’m using kickstart to automate the installation process and to get a consistent installation state when deploying ESXi. In general there are 2 options if you want to install ESXi : interactive and scripted. 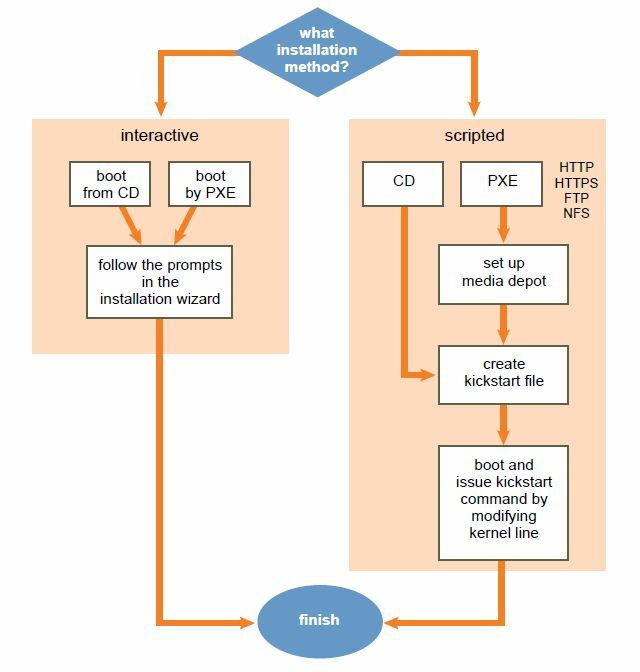 As you will probably understand, kickstart is the core of the scripted installation. The kickstart.cfg file is the file that contains the configuration settings for your ESXi installation and more. The picture below shows the different options you have for installing ESXi onto your hardware. Both installation method use either CD or PXE to install ESXi. The key difference is the kickstart file. The most commonly used scripted installation is the PXE method. With PXE you boot your server into a PXE image which deploys your ESXi from a media depot hosted through HTTP(S), FTP or NFS. This media in combination with your kickstart file will created a custom ESXi server. For the deployment I have been using HP Insight Control Server Deployment 6.2 (former HP Rapid Deployment Pack (RDP)) an OEM version of Altiris Server Deployment 6.9. As far as I know the only commercial tool at the moment that supports ESXi 4.1 deployment. There are however also two freeware appliances available for PXE ESXi deployment. Ultimate Deployment Appliance (UDA) and ESX Deployment Appliance (EDA) can be downloaded from the VMware Virtual Appliance Marketplace. But you can also take a look at the ESXi Installable and vCenter Server Setup Guide which gives good leads on building your own PXE deployment solution. This deployment pack generally gives you a basic installation of ESXi if you don’t edit the kickstart file. The only thing you have to do afterwards is assign the job to a specific HP server and it will install ESXi out-of-the-box. The kickstart file below is used in conjunction with HP Insight Control Server Deployment. This tool has a database with all the configuration variables per server object. The @@VARIABLES@@ in the kickstart script below are replaced each time the installation job is executed. This creates a server specific kickstart file for each server in your server park. The lines until %firstboot are created to install ESXi. All commands after that line will be executed after the ESXi host has booted for the first time. #Clear the local hard drive. # Determine if this is a cluster with EMC or HDS storage. Cluster with mixed storage not allowed! If mixed EMC settings apply! # Only enable this when doing testing with kickstart! Update : Have added the enabling of the Management Traffic. Thanks to @lamw.